Why is my hydrodynamic thrust bearing running hot? When you hear this question, it is natural to think that there is something wrong with the thrust bearing. This is not always the case. Bearing performance information can give you the symptoms of what is wrong with your machine or in this case the lubricant. One example is a 7" LEG 6-pad hydrodynamic thrust bearing that over time, had pad temperatures increase from 100°C to as high as 140°C. 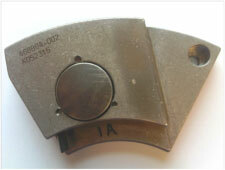 A thrust pad from this bearing is shown in Figure 1. Another example is a 6" LEG 6-pad hydrodynamic thrust bearing that after a few months in operation had a temperature difference of almost 20°C between two pads. 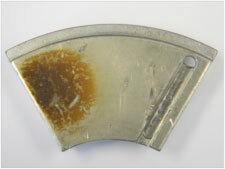 A thrust pad from this bearing is shown in Figure 2. Note that rising pad temperatures and large differences in temperature readings over time are typical behaviors when varnish forms on thrust pads. Both bearings were installed in compressors and used ISO VG 32 viscosity oil. 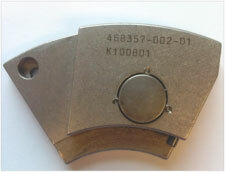 Each pad shows signs of varnish deposits toward the trailing edge of rotation. When reviewing the design conditions, the pad temperatures should have been much lower. A common thought is that the thrust load must be higher than expected. Some customers may even ask the bearing supplier to predict the actual thrust load based on the measured pad temperatures. This value can be misleading since the predicted thrust load with the higher pad temperatures does not take into account the effect of varnish deposits on the pads. These hydrodynamic bearings were not overloaded. As shown in Figures 3 & 4 below, the pad supports are in excellent condition and show no signs of indentation or hard contact. Figures 5 and 6 are magnified views of the varnish on the thrust pads. Varnish is a hard, solid material that bonds to the babbitt surface. These deposits alter the surface finish of the thrust pads by diminishing the flatness and smoothness of the babbitt surface. With oil film thicknesses typically in the range of 13 to 51µm (0.0005" to 0.002"), this thin layer of varnish interferes with the hydrodynamic oil film in the bearing. It decreases the load carrying area of the pad and reduces the oil film thickness. The varnish builds up over time and the pad temperatures rise accordingly. Eventually, the oil film breaks down and the collar contacts the pads. The touch wipe may actually remove enough of the deposits to restore the hydrodynamic oil film. With a smoother babbitt surface, the pad temperature readings may be lower than before the wipe. This whole process can repeat itself periodically. An FTIR (Fourier transform infrared) analysis was performed on varnish samples from the tilting pads and both pads had similar results. The first FTIR spectrum was from methylene chloride that was used to extract the soluble portions of the varnish material. This showed the presence of esters, carboxylic acids, and unsaturated (or thermal decomposed) acids in the spectra. 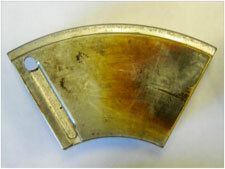 The second analysis was performed on a varnish sample scraped off from the tilting pads. The major component was a combination of phosphates and pyrophosphates. The results from the analysis determined that the root cause of the varnish deposits is oil oxidation. This permanent degradation of the oil occurs as additives in the oil become depleted. The antioxidants from the oil are removed and bigger, less soluble molecules form that will eventually develop into varnish. These molecules cluster, grow in size and form into a hard solid material that bonds to the pad babbitt. 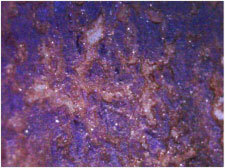 As heat is generated from the shearing of the oil film, the overheated varnish deposits start to "cook" and decompose. This heating causes the coking of the organic carbon chains and only the phosphate inorganics remain. The deposits on the tilting pads gave the diagnosis of the problem. To resolve the problem, the oil needs to be analyzed over a period of time. 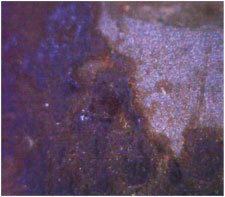 The oil will provide much more information than is available by analyzing the deposits on the pads. The solution may be as easy as replenishing the antioxidants on periodic basis or more extreme measures such as having to switch to a PAO (Polyalpha olefin) or PAG (Polyalkylene glycol) synthetic oil. The varnish potential of the oil can be monitored by additional tests such as Membrane Patch Colorimetry (MPC) and Linear Sweep Voltammetry or RULer (Remaining Useful Life evaluation routine). Including these tests with viscosity, total acid number (TAN), ISO particle count and water contamination analysis is a proactive approach to ensure the lubricant is "healthy". Consult a Lubrication Engineer or on-line expert for recommendations on your specific lubrication system. Livingstone, G., Prescott, J., & Wooton, D. (May, 2008), "Soluble Varnish – The Final Piece to the Puzzle", Proceedings Lubricant Excellence 2008. Gatto, V., Livingstone, G., Moehle, W., & Wooton, D. (May, 2007), "Practical Approaches to Controlling Sludge and Varnish in Turbine Oils", Proceedings Lubricant Excellence 2007. Noria Corporation (May, 2003), "The Lowdown on Oil breakdown", Practicing Oil Analysis. Livingstone, Greg, (January, 2003), "Solving Varnish Problems at Power Generation Facilities", Practicing Oil Analysis. Wooton, Dave (January, 2012), "Kingsbury Thrust Bearing Shoes – 791762-3"